Office visit appointment is strongly recommended in order to provide best medical service for you and other patients who visit my clinic. Basic information such as your name, age, address will be recorded on provided papers and vital signs like pulse, blood pressure, heartbeat, respiration and history and family history also needed to be recorded by patient. If you have diabetes and/or hypertension, more detailed information will be needed. Please note name of prescribed medicine you taking for the condition(s) or disease(s). Also provide the clinic that reason(s) visiting and list of detailed symptoms for more accurate diagnosis. My clinic use In-Body which is widely used to analyze patient’s body composition such as BMI, Total Body Water. The clinic believes that knowing your body composition helps better understanding patient’s current condition. During basic exams respiration rate and pulse could be taken for figuring out your bio rhythm. Physical exams including palpation, Range of Motion(ROM), muscle strength, neurological exam such as dermatomes, myotomes and reflexes will be normally used for diagnosis and root causing reason(s) of symptom(s) or discomfortness that patient complaints about. If a medical staff finds out symptom that requires blood test, X-ray or MRI, one or more additional test(s) would be referred to radiologists. Doctor will have consultation with patient based on various exams and test. The doctor will find root cause reasons of the symptom through exams and consultation. 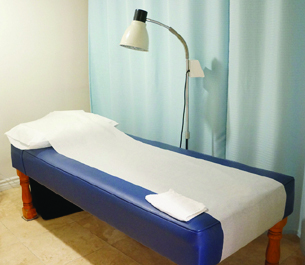 Patient will be treated by modalities of Asian medicine such as acupuncture, moxabustion and also laser therapy, Kinetic decompressing device, ultrasonic or radio wave medical devices could be applied as needed. Also taking natural herb formula would be advised for maximum treatment result.